Many businesses operate online nowadays. There are still many people that write, send, and receive checks since it’s a great reliable way to transfer money. But scammers are using checks too. Many people fall victim to a fake check scam, it is seen as an epidemic. 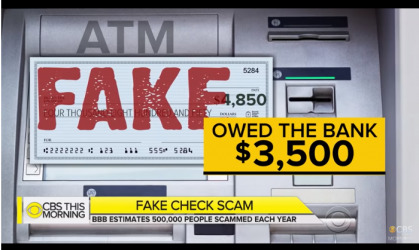 Billions of fake checks are circulated every year according to the Better Business Bureau. These checks seem to come from legitimate businesses and are sent to people along with a simple request. CBS reported that Auriyon Jacobs, a college student from Oakland California. She received a job offer to advertise for PepsiCo. Since the offer stated it was from a fellow student, Jacobs applied for the job. All she had to do was drive around with a Mountain Dew as on her car and she would earn $250 a week. Jacobs received a check for $5,000 after PepsiCo accepted her application. She was instructed to withdraw $3,500 from the depsoited check and into the alleged scammer’s account. This was to cover the cost to install the ad on her car. When Jacobs withdrew the money, she was alerted by her bank that the check she deposited was fake days later. Jacobs already withdrew the $3,500 into the alleged scammer’s account, which she was now responsible for. She planned on using that money for tuition, rather than pay off a scammer. Jacobs is not the only victim that fell for the fake check scam. In 2017, there were about 30,00 fake check complaints and people reported losses of about $38 million. 21% of complaints were people in their 20’s over the last two years. The postal inspection service told CBS News that they confiscated $62 billion of fake checks in 2017. The best way to avoid this scam is to be cautious when receiving checks from someone you do not know. Wait at least two weeks to be sure that the check is cleared before spending any of it.